On Dec. 6, New York’s Suffolk County government will hold a public hearing on a proposal to ban aerial spraying of aluminum oxide, barium, sulfur, and other salts into the air over the county without first filing an Environmental Impact Statement with and receiving approval from the county’s Department of Health Services, Division of Environmental Quality. If this proposal becomes law in Suffolk County, Long Island, it would be the first County to do so in North America. Exempted from the proposed ban are aerosol spraying operations for agriculture, and for lyme disease, Eastern equine encephalitis (EEE), West Nile virus (WNV), and other disease vector control operations. The hearing will be held at the Riverhead Legislative Auditorium, Evans K. Griffing Building, 300 Center Drive in Riverhead, NY at 2:30 pm. If the public is able to convince legislators of the risk from such geoengineering operations, the legislation will then be voted on at the Dec. 20th session. Otherwise, the proposed ban will be tabled indefinitely. Involved in Suffolk County government since 1989, Romaine is a fiscal conservative who prioritizes saving farmland and protecting the environment. In August, he organized Long Island’s first countywide farmers market, along with the Long Island Farm Bureau. Romaine has represented the 1st District (eastern end of Long Island) continuously since 2005. He serves on the Environment, Planning & Agriculture Committee, which voted on Nov. 28 to submit the proposed law banning such aerial spraying to a public hearing. The Pikoulases and Ciresi will speak on Dec. 6 and are urging people to “pack the hearing” to show support for the ban. Cindy Pikoulas of LISW spoke with New York Sky Watch radio on Nov. 20, when she advised that tree samples from Suffolk show high levels of barium, strontium and aluminum. She is asking Long Islanders to have their water and trees tested for these chemicals in order to build a body of evidence that would spur investigations by health and environment authorities. Eastern equine encephalitis (EEE) is a rare but serious viral disease caused by a virus transmitted by the bite of an infected mosquito with more severe symptoms than for West Nile virus. EEE is an arbovirus (short for arthropod-borne, meaning spread by insects). Birds are the source of infection for mosquitoes, which can sometimes transmit the infection to horses, other animals, and, in rare cases, people.West Nile Virus (WNV) was first seen in the US in 1999, in the New York City area of Queens. WNV can live in a number of types of birds and is passed bird to bird by certain types of mosquitoes. Occasionally, an infected mosquito will pass the virus to humans or other animals. Most healthy people do not get sick from the virus, but sometimes it may cause symptoms. Per the US Geological Survey, two horses caught WNV in 2011 and 12 caught EEE, none of them in Suffolk. Of humans, 43 contracted WNV in New York State in 2011, four of them in Suffolk County. Only one person contracted EEE in the entire state. Considering that the population of NYS is 19 million, the application of toxic chemicals purportedly to control for such rare vector-borne diseases where only 44 people became ill in 2011 seems absurd. US health officials admit that Ugandans and Egyptians, where WNV was first discovered, develop a natural immunity before reaching adulthood. Using toxic chemicals that pollute the environment, leading to cancer and respiratory diseases, instead of allowing humans to develop immunity to such diseases is an unsustainable and irresponsible control method. Whether these vector control spray programs are involved in other activities such as solar radiation or rainfall management is uncertain. 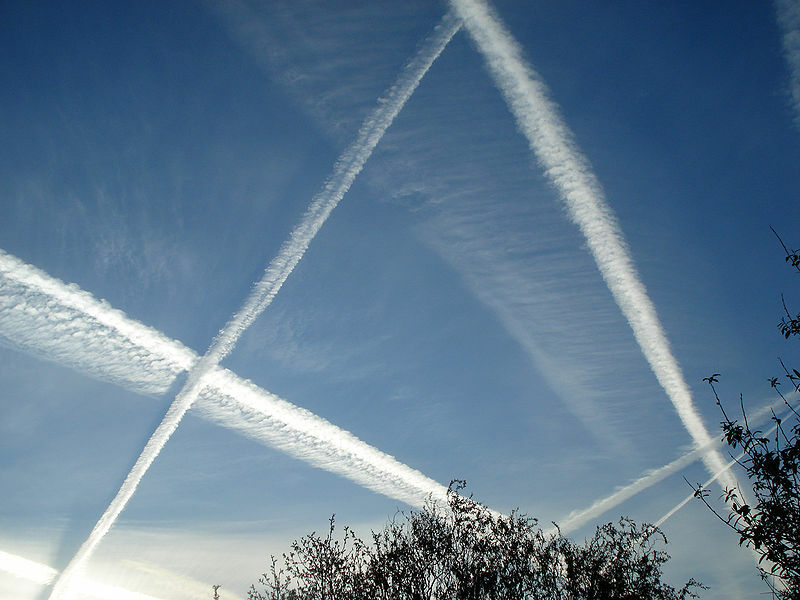 But, in addition to the obvious jets laying chemtrails at 30,000 feet, they may be involved in contributing to the high levels of aluminum, barium and strontium found in Suffolk waters and trees. This Legislature hereby finds and determines that Suffolk County is a leader in environmental protection and has several programs to protect soil and groundwater from contamination. This Legislature also finds and determines that air pollution is another environmental issue that can impact the health and safety of County residents and may also contaminate soil and groundwater. This Legislature further finds and determines that concerns have been raised that business and government entities may be discharging polluting chemicals, including barium, sulfur, salts, and aluminum oxide, into the air, which may impact weather and other environmental elements. This Legislature finds that such particulates eventually fall from the atmosphere, exposing the public to these air pollutants and, upon landing, may contaminate soil and water. This Legislature determines that County residents may be exposed to these chemicals while they are in the atmosphere, which can cause respiratory and other health problems. This Legislature also finds that, to protect County residents from potential harm, any person who plans to discharge these chemicals into the airspace over Suffolk County should first file an Environmental Impact Statement with and receive approval from the Department of Health Services, Division of Environmental Quality. Therefore, the purpose of this law is to require any person who plans to discharge sulfur, barium, salts or aluminum oxide into the airspace above the County of Suffolk to file a complete Environmental Impact Statement with the County prior to taking such action. As used in this law, the following terms shall have the meanings indicated: “PERSON” shall mean any natural person, individual, corporation, unincorporated association, proprietorship, firm, partnership, joint venture, joint stock association, or other entity or business of any kind. Any person who plans to discharge sulfur, barium, salts or aluminum oxide into the airspace above the County of Suffolk must file a completed environmental impact form, as established in Section 4 of this law, with the Suffolk County Department of Health Services, Division of Environmental Quality and with the Clerk of the Suffolk County Legislature and receive the approval of the Division of Environmental Quality prior to engaging in such discharge. The Department of Health Services, Division of Environmental Quality is hereby authorized, empowered and directed to develop an environmental impact form to be used by persons wishing to discharge sulfur, barium, salts or aluminum oxide into the airspace above the County of Suffolk. Such form shall require applicants to detail the nature and purpose of their proposed discharge and any potential environmental and/or public health impacts that may result from such discharge. The requirements set forth in this law shall not apply to any person engaging in aerosol spraying for agricultural or vector control purposes. A. Any person who violates any provision of this law shall be liable for a civil penalty of up to $2,500 for an initial violation, with a fine of $5,000 for each subsequent violation. B. Any civil penalty may only be assessed by the Commissioner of Health Services following a hearing and opportunity for an alleged violator to be heard. Section 7. Rules and Regulations. The Commissioner of the County Department of Health Services is hereby authorized and empowered to issue and promulgate such rules and regulations as he or she deems necessary to implement and carry out the provisions of this law. This law shall apply to all actions occurring on or after the effective date of this law. If any clause, sentence, paragraph, subdivision, section, or part of this law or the application thereof to any person, individual, corporation, firm, partnership, entity, or circumstance shall be adjudged by any court of competent jurisdiction to be invalid or unconstitutional, such order or judgment shall not affect, impair, or invalidate the remainder thereof, but shall be confined in its operation to the clause, sentence, paragraph, subdivision, section, or part of this law, or in its application to the person, individual, corporation, firm, partnership, entity, or circumstance directly involved in the controversy in which such order or judgment shall be rendered. This Legislature, being the State Environmental Quality Review Act (SEQRA) lead agency, hereby finds and determines that this law constitutes a Type II action pursuant to Section 617.5(c)(20), (21), and/or (27) of Title 6 of the NEW YORK CODE OF RULES AND REGULATIONS (6 NYCRR) and within the meaning of Section 8-0109(2) of the NEW YORK ENVIRONMENTAL CONSERVATION LAW as a promulgation of regulations, rules, policies, procedures, and legislative decisions in connection with continuing agency administration, management and information collection. The Suffolk County Council on Environmental Quality (CEQ) is hereby directed to circulate any appropriate SEQRA notices of determination of non-applicability or non-significance in accordance with this law. This law shall take effect immediately upon filing in the Office of the Secretary of State. Rady Ananda specializes in Natural Resources and administers the sites, Food Freedom and COTO Report. This entry was posted in Alternative Health, Environment, World News and tagged aerial spraying, ban, chemtrails, law, North America, Suffolk County by cnlib. Bookmark the permalink. ”Apparently weather modification is only a conspiracy theory when the alternative media talks about it, even when the existence of the practice is completely and totally irrefutable.